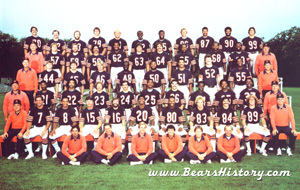 The 1981 Bears team photo. For some reason they took the wide receivers out of numerical order and put them in the front row. It was hard to take many positives for the Chicago Bears from the 1981 season, aside from the fact that a new coach with a fiery attitude would roll into town the following January. Players began to comment by season's end about the lack of discipline among some players. During the October 19th loss to Detroit at the Silverdome, it has recently been made public that a starting wide receiver entered the locker room early to make some personal telephone calls. Bears Coach Neill Armstrong failed to discipline the player, which led to widespread dissention. The team's record for the first half of the season was 2-6, their worst start to a season since 1975. In many of these performances, the Bears were humiliated. On October 19th, new Detroit quarterback Eric Hipple put on the best opening performance on Monday Night Football in history. Many thought he would choke in his national television debut, but he was on fire as the Lions defeated Chicago 48-17. However, there was one positive realized during the 8th game of the season. San Diego, with its high-powered offense led by Dan Fouts, John Jefferson, Chuck Muncie, and Kellen Winslow, came into town as heavy favorites. Noone expected them to be shut down by the Chicago defense that featured such unknown rookies as Mike Singletary. However, defensive coordinator Buddy Ryan was experimenting with a new defense he called the "46", named after hard-hitting safety Doug Plank. To counter San Diego's potent passing attack, Ryan installed an experimental lineup that featured 5 linemen, 1 linebacker, and 5 defensive backs (dubbed his 5-1-5). Ryan's gamble paid off, as San Diego was unable to get their passing game untracked, and the Bears won in overtime, 20-17. After another loss at Tampa, Chicago traveled to Kansas City to face another powerful AFC West team. The Bears battled them fiercely, and the game ended up deadlocked at 13-13 at the end of regulation. The Bear defense was on fire, harassing Kansas City's offense the whole game. In almost a repeat of the previous year, rookie wide receiver Ken Margerum returned the opening kickoff over 50 yards, which resulted in Chicago's game-winning field goal by new kicker John Roveto. After the win at Kansas City, the Bears lost three straight, dropping their season record to 3-10. The final game of this three-game losing streak was a 10-9 loss at Dallas on Thanksgiving Day. Chicago held their own, and Walter Payton put on a show with a 38 carry, 183 yard performance. Perhaps the best television shot of the day was that of a screaming Dallas tight ends coach named Mike Ditka, whom the Bears organization would become re-acquainted with soon. Ditka's arrival was almost delayed, however, as the team put on a late-season 3 game win streak. Coach Neill Armstrong would point to this as the sign that things were turning around before the decision was made to release him. Included in the 3 game streak to end the season were victories at Oakland, and at home over Denver. This completed the sweep of the powerful AFC West teams. Most importantly, these four victories signaled the emergence of a soon-to-be dominant defense, which played a large role in all the victories. Neill Armstrong was indeed dismissed by George Halas on January 5, 1982, and a new head coach, Michael Keller Ditka, was introduced to Chicago on January 20th. Passing: Vince Evans- Evans started all 16 games, one of only three Bears quarterbacks to do so over the last 28 years. He passed for over 2300 yards, but also threw 20 interceptions, resulting in a 51.0 passer rating. Rushing: Walter Payton-Payton slowed again, probably most due to a transitioning offensive line. He gained 1,222 yards but his average per carry dropped a full yard to 3.6. Receiving Yards: Ken Margerum-The 1981 rookie from Stanford caught 39 passes for 584 yards. Payton again led the team with 41 receptions. Scoring: John Roveto- Roveto was signed off the street where he was working for a tire dealer. He was the third kicker to play for the Bears in 1981 and led the team with 49 points scored. Sacks: Alan Page- Page led the Bears with 9 sacks, and added a fumble recovery and four passes defended. He would retire following the '81 season. Interceptions: Gary Fencik-Led the team with six interceptions, and knocked down an additional 17. Vince Evans started all 16 games at quarterback, and Matt Suhey supplanted Roland Harper at running back opposite Payton. Ken Margerum, Brian Baschnagel and Rickey Watts alternated at wide receiver. Al Harris moved into Mike Hartinstine's right defensive end spot, Mike Singletary and Otis Wilson became starters at linebacker, and rookie Reuben Henderson started at cornerback. From left to right: Offense Vince Evans, Walter Payton, Matt Suhey, Ken Margerum, Brian Baschnagel, Ted Albrecht, Noah Jackson, Dan Neal, Emanuel Zanders, Keith Van Horne, Robin Earl, John Roveto. Defense Al Harris, Alan Page, Jim Osborne, Dan Hampton, Gary Campbell, Mike Singletary, Otis Wilson, Reuben Henderson, Gary Fencik, Doug Plank, Terry Schmidt, Bob Parsons. The writing was on the wall for Bears' head coach Neill Armstrong during the 1981 season. And the writing wasn't good. Armstrong had been hired by Jim Finks to replace the departed Jack Pardee in 1978, and had Minnesota Viking roots as did Finks and defensive coordinator Buddy Ryan. Finks liked him--but 86-year-old founder and owner George S. Halas was back sniffing around practices and meetings, and had been heard saying the team "had better make the playoffs this year." Armstrong hired a new offensive coordinator in '81, Ted Marchibroda who was former (and future) head coach of the Baltimore Colts. Marchibroda was known to be a quarterback and passing game guru, but his presence didn't seem to help. Late in the season, Halas himself hired former Bears coach Jim Dooley and inserted him into Armstrong's staff as an offensive assistant. Many believed it was to serve as a mole for Halas himself. The Bears were losing more regularly than winning in '81, and the team seemed to be falling apart discipline-wise. Wide receiver Rickey Watts left the field early to make a phone call during the embarrasing loss to Detroit on Monday Night Football, and later in the season was drinking in the locker room. Watts was not punished. "We used to call him 'Nice Neill'," said linebacker Doug Buffone. Some in the media, as well as Finks, called for moderation in handling Armstong, pointing to a three-game win streak to end the season. But Halas had made up his mind, and fired Armstong in January. The Bears started the season 1-6. One interesting happening early in the season occured with Chicago's kicking game. Dependable veteran Bob Thomas injured a hamstring, and had to be replaced with Michigan State's Hans Neilsen. The kicker missed his first two tries and was replaced by tire dealer John Roveto. Roveto finished the season as kicker and led the Bears in scoring. Though the Bears finished with their worst record since 1975, they swept tough AFC West opponents each time they faced them. The addition of young players Keith Van Horne, Steve McMichael, Mike Singletary, Leslie Frazier, and Jay Hilgenberg was the first sign of a great team in the making. Wide Receiver James Scott left the Bears to sign with a team in the CFL. Punter Bob Parsons set a record no punter would particularly want to set. In 1981, he set the NFL record for most punts in a season with 114. The Bears make up for not drafting Joe Montana by stealing Mike Singletary from the 49ers. Chicago trades its fifth-round pick to San Francisco to move up two spots and select Singletary in the second round. 49er coach Bill Walsh later regretted the move. The Cincinnati Bengals and San Francisco 49ers storm the league, finishing 12-4 and 13-3 to win their respective conferences. Tampa Bay wins its second NFC Central crown in three years, but the Bucs are slaughtered 38-0 at Dallas in the divisional round. Each conference championship game is memorable. In the AFC, Cincinnati defeats San Diego in frigid temperatures, while the 49ers beat Dallas on "The Catch" in San Francisco. Montana leads the 49ers to the first of their Super Bowl victories over the Bengals, 26-21 in Detroit. Traded fifth-round pick to San Francisco to select Singletary.